Toothbrushes aren’t meant to last forever. The brushing that you do to keep your smile looking great can really take a toll on your toothbrush. My dental office in Nottingham wants to remind patients using a brush with frayed, worn-out bristles that it may be time for a change. 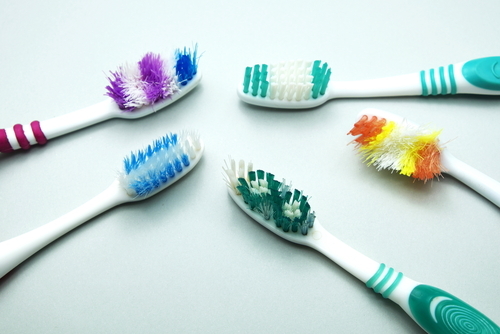 Worn out brushes are much less effective at keeping teeth clean, so it’s important to use a new toothbrush when needed. The American Dental Association (ADA) recommends replacing your toothbrush every three to four months — and my dental office in Nottingham would definitely agree! You don’t even have to wait that long. If the brush starts looked ragged and scary earlier than that, change it anyway. And keep an eye on kid’s brushes too. They need to be changed out more often than adult brushes. Your dentist in Nottingham wants to always ensure you’re doing the very best to keep you and your smile healthy. One of the ways you can help do this is to keep your toothbrush from becoming scary and frayed. Keep on brushing, and remember to rinse and store your brush properly when you’re all done.